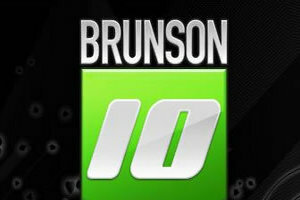 aqThe 7th spot in the Brunson 10 is up for grabs, and the competition is between four of the best online talents in the world. The four players vying for the spot are David “Doc Sands” Sands, Faraz “The Toilet” Jaka, Dan “DJK123” Kelly, and Michael “Martin23” Martin. Unlike the first six members were selected by Doyle Brunson based on their past performance and reputation, the seventh spot will be earned based on merit, with the player who accumulates the most leader-board points at the 2010 WSOP being elevated into the Brunson 10 –although a few strong performances may see multiple players get the nod to join the Brunson 10. The current standings for the competition show Sands out to a strong lead (he’s also had an excellent performance on Day 1 of the $1,500 PLO8 tournament. Maybe with “Martin23” sitting on 0 points he should go look into Video Poker Strategy. This entry was posted on Wednesday, June 23rd, 2010 at 7:23 am and is filed under Poker News. You can follow any responses to this entry through the RSS 2.0 feed. You can leave a response, or trackback from your own site.